​Joel Lee Murray Sgt., US Army Operation Iraqi Freedom “Always Ready” 9 July, 1981 - 4 Sept., 2007. 301 South Elkhorn Street, Simpson, Kansas. 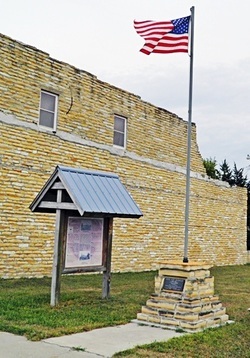 This monument is an ongoing project, with several new Post Rock Limestone slabs to be added in 2016 to include the list of county veterans from World War I to the present day. LEST WE FORGET In Deep Appreciation of the Sacrifices Made by the Men and Women of Mitchell County Who Served in World Wars I and II. 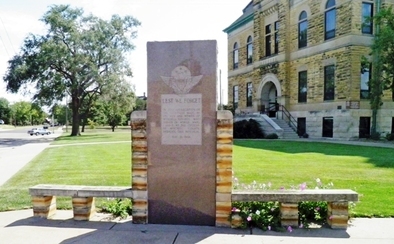 We, the Citizens of Mitchell County, Dedicate This Memorial May 31, 1948. ​111 South Hersey Avenue, Beloit, Kansas. This brick monument is topped by a bronze Statue of Liberty. Emily Candice William Slaven Donated This Statue Of Liberty In 1950 To The City Of Glen Elder. Her descendants and their spouses who served in World War II were: Max Slaven, Edmond Slaven, James Slaven, Kirwood Vint, Jack Davis, J. Duane Vint, Vinton Vint, Dorothy Vint McKinney, Vaden McKinney, Russell Merrill, Francis Farrow, Alvin Logue, Raymond Fritchen, John Kalousdian, Joe Gaston, Harold Nelson, Kenneth Meyers. East side of town square, 100 Block of South Market Street, Glen Elder, Kansas.